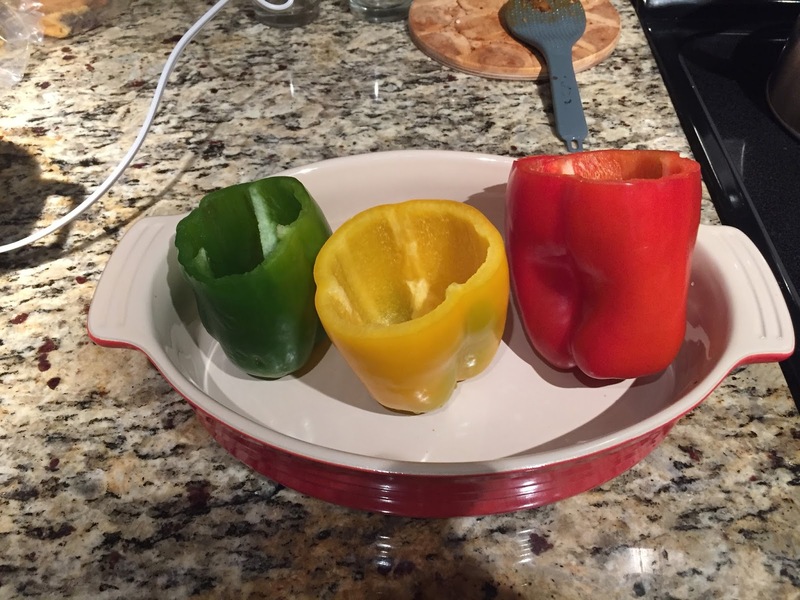 I have seen many recipes for stuffed peppers so I decided to make my own, It was relatively easy prep and incredibly delicious! I made it for both my boyfriend and I which calls for regular beef and veggie crumbles but you can make either or, you just might need to use more veggie crumbles. 2. Start cooking your rice on the stove or in a rice cooking container. 3. 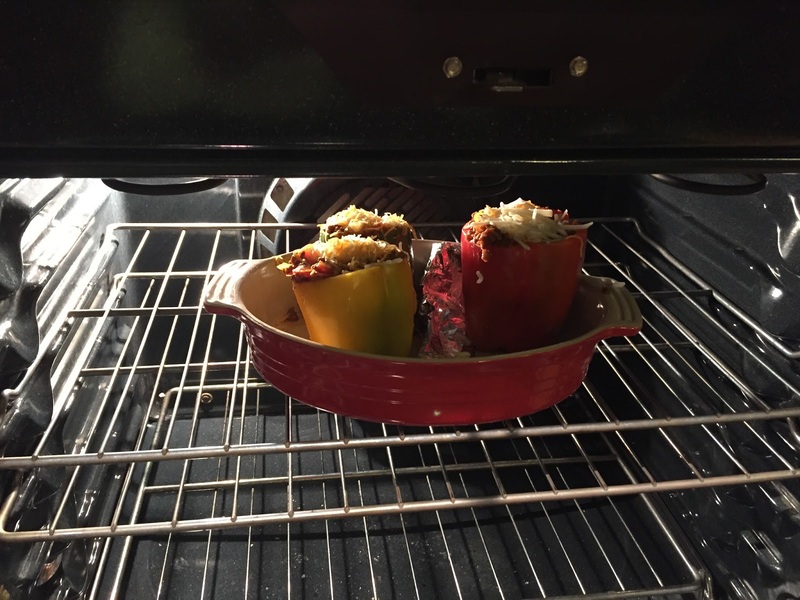 Take your peppers and cut off the tops and scoop out the inside and place in a baking dish. 4. From there, take your meat options and begin to cook on the stove. 5. The veggie crumbles can have water and seasoning added in the beginning, for regular beef, wait until it has begun to brown to add in water and seasoning. 6. Chop up the onions and tomatoes into small pieces. 7. Once you have a nice mixture on the stove cooking for a few minutes, add in the onions, tomatoes and some cheese. Beef on the right, veggie crumbles on the left. 8. Once your mixture has lost its water content, place taco meat into your peppers, add in the black beans and rice when it has finished cooking and place in the oven to cook for 35 minutes. 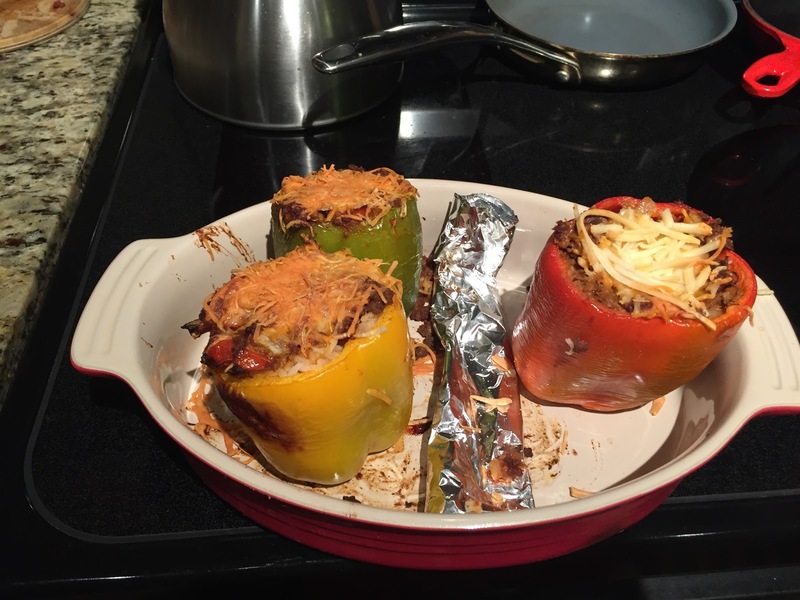 I like to separate the beef from the veggie crumbles by using a tinfoil barrier so no beef gets onto the veggie stuffed pepper. 9. Once your dish is done cooking, sprinkle some cheese, guacamole and salsa on top and enjoy! If you have leftovers even better!